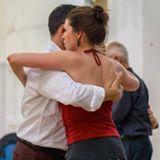 After the success of the Cambridge Tango festivalito in 2014, Carlitos Espinoza y Noelia Hurtado are returning to Cambridge this fall with all new topics for the 2016 edition of the Cambridge Tango Festivalito. Watch the spectacular performances they gave during the last Festivalito, 2014 edition below! You will also have the opportunity to dance to the sound of the best DJ's from around the UK during milongas and tango cafes, namely Michael Lavocah, Pablo Stafforini and Ricardo Peixoto. All milongas and workshops will take place in Saint Paul’s church and Saint Phillip’s church center both close to the city center and the train station. Workshops are filling up, so sign up soon! Cambridge is conveniently located 50min away from London by train and 30 min from Stansted airport. See you soon at the CamTango Festivalito!